This generation has grown up online—and in the shadow of unimaginable violence. We ignore their wisdom at our peril. 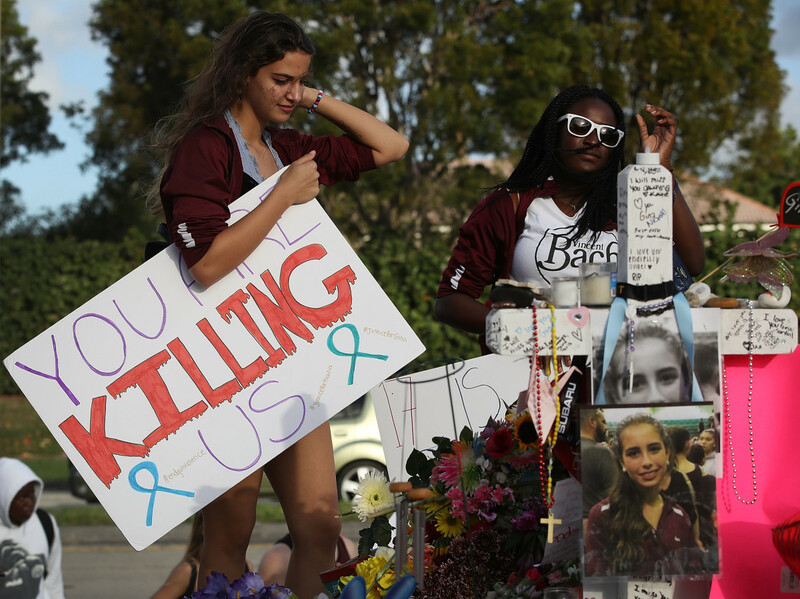 Haleigh Grose, a ninth grader at Marjory Stoneman Douglas High School, at a memorial in front of the school where 17 people were killed in Parkland, Florida. Young people are taking charge of the conversation about gun reform, and America has been racing toward this moment for a long time. It seems like a logical conclusion for a generation that was born into a post-Columbine America. Gun violence certainly didn’t begin in April of 1999 with the Columbine High School shooting in Columbine, Colorado, which resulted in 13 victims dead and 24 injured, but Columbine was the first school shooting in my lifetime that caused a nationwide moral panic; perhaps because of the scope of it, or because of the moment it happened in, or perhaps because of how we came to imagine the secret lives of the perpetrators. Dylan Klebold and Eric Harris appeared in the media as two outcasts who&apos;d carried out a shooting inspired by an obsession with violent video games. Columbine also took place in the midst of widening use of the Internet, as it became a much more socially connected space. Harris created a blog on Aol in 1996 to track his progress on the video game Doom, but by 1997 the blog had become increasingly violent. He wrote about building bombs, and listed threats against the students and teachers of Columbine High School. 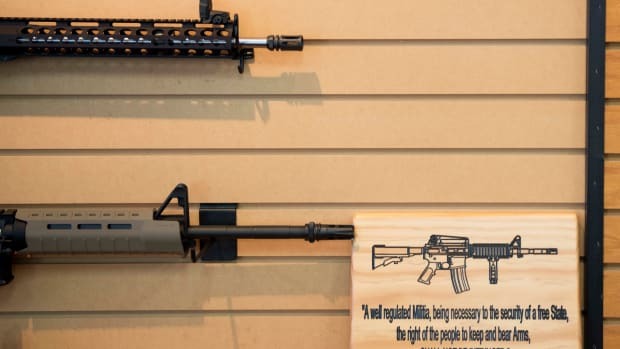 Because Americans will call anything a weapon to avoid dealing with its actual weapons, everything in the weeks and months after Columbine became an effort to extract small threads from a large ball of yarn without dismantling the ball itself. Video games were the problem, and then it was music, and then it was the Internet, growing at a rate which couldn&apos;t be kept up with or monitored by parents who were not nearly as savvy as their children. Marilyn Manson wrote an op-ed in Rolling Stone about how the shooting hadn&apos;t been his fault. It was decided that goth culture was to blame, and then it became clear that everyone had such a loose grasp of what goth culture was that any kid who showed up to school in black or in a trench coat was seen as a potential murderer. This is America, after all. We love our scapegoats and the lies they allow us to continue to tell ourselves. There have been 122 people killed in mass school shootings since Columbine, and people still say that it&apos;s the songs or the video games or the vastness of the Internet that we should blame. On the afternoon of February 14th, 19-year-old Nikolas Cruz walked into Marjory Stoneman Douglas High School in Parkland, Florida. Cruz was a former student at the school, one who had repeatedly demonstrated threatening, abusive, and violently bigoted behavior. He entered the building with an AR-15 and killed 17 people, wounding 14 others. 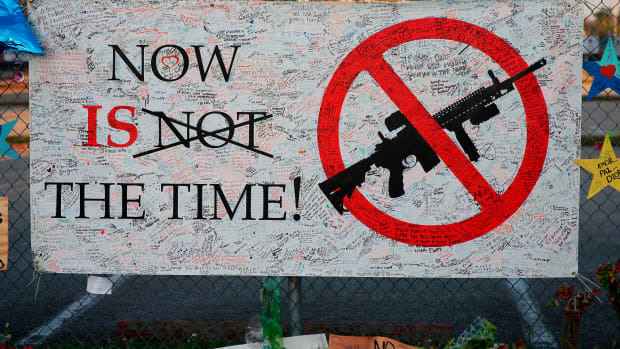 DISSECTING AMERICA&apos;S MUTED RESPONSE TO MASS SHOOTINGS: The U.S. is stuck in a vicious cycle, not just of bloodshed, but also of helplessness. Though this kind of gun violence has become routine in America, the Parkland shooting felt different, not just in the aftermath we&apos;re seeing now, but also as it was happening. Students were using Snapchat and Twitter to archive the movements of the shooting, some perhaps hoping to leave behind a posthumous trail in their final moments alive. This spectacle was haunting to witness, but it was also a manner of citizen reporting—of letting those on the outside know exactly what was going on inside, so that the kids in danger could best be helped. It was an act of bravery, even in the face of a fearful realization around how normal this has all become—both the violence and our reliance on social media. Today&apos;s teenagers didn&apos;t invent social media, though they are often derided for their ability to navigate it. Adults in power have found it easy to dismiss the young for years. Yet consistently it has been young people, often students, leading protest movements for decades now. It was students who were protesting the United States&apos; bombing of Cambodia at Kent State University in 1970, before Ohio National Guardsmen shot four of them dead. It was students in 1972 who set up Freedom Schools in Houston to continue the education of Mexican-American students who were boycotting the segregated school system. That trend extends to the present: It was students leading protests at the University of Missouri in 2015, and at Yale University in 2016. It has been largely young people organizing on the front lines of Black Lives Matter movements all around the country for years. There is an intersection happening here: The people who have the most years left on Earth are also finding the clearest visions for how to improve the place they&apos;re in. 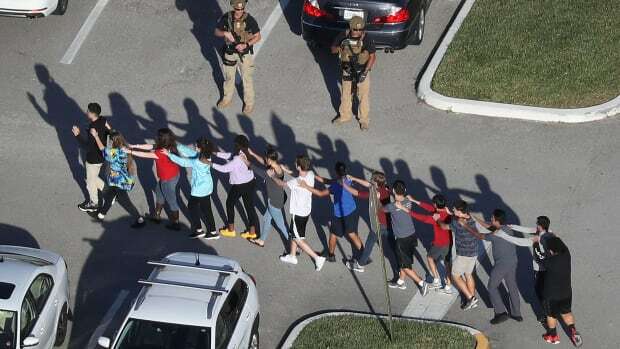 The students of Parkland are mobilizing with students across the country. It seems like they all want to make this latest shooting the one that the news can&apos;t move on from. It&apos;s tough to say how much stamina their movement will have; a major function of the current news cycle is that it acts as an avalanche, an accumulation of everything, all at once, until nothing can really last. 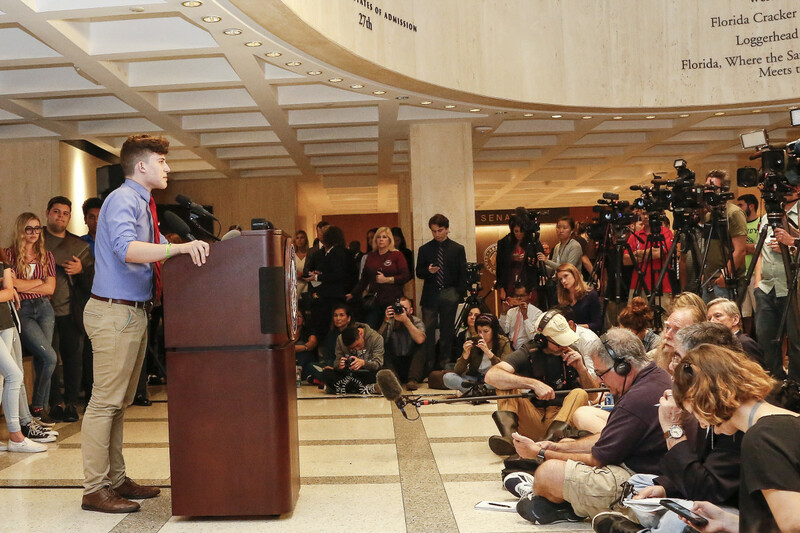 Kevin Trejos, a student from Marjory Stoneman Douglas High School, speaks at the Florida State Capitol building on February 21st, 2018, in Tallahassee, Florida. 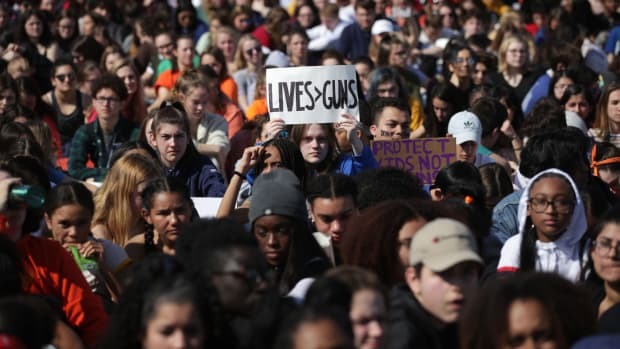 The students are smart, articulate, and direct in what they want: gun reform, or at least a country where schools are safer—and they&apos;re mobilizing using the means for which they are derided: social media. 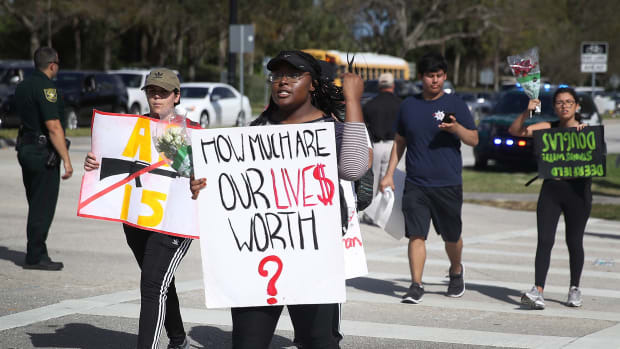 There have been efforts on Snapchat that track protests and walkouts. There have been teenagers connecting with each other through Twitter hashtags to present a unified front. Adults have taken notice, with George and Amal Clooney donating half a million dollars toward resources for a March on Washington planned by students. Oprah matched their donation. It does bear mentioning that a lot of the young black activists aligned with Black Lives Matter could have used some of this financial support and the visibility that comes with being backed so publicly and eagerly by older celebrities with national platforms. What we are talking about, in both movements, is a restructuring of American ideas of violence, and those who are most affected by the current structures. While it is thrilling to see a unified front joining the students after the Parkland shooting, I hope that perhaps there can be a reconsideration of opening up those same resources and types of support to the young activists of color who have been in the streets since the killing of Trayvon Martin. 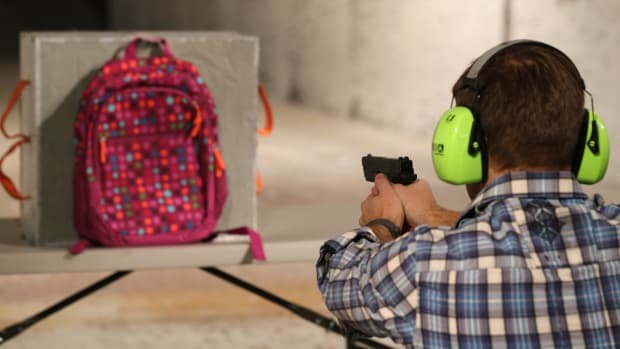 Various politicians, including the president, have made noises about adding more guns in schools, insisting that a well-trained teacher with a gun could stop a mass shooting. When you think about that message, it all seems so absurd. Arming teachers in a classroom with students is not clear thinking, but what it does do is continue to afford society a way to talk around a problem without addressing its roots. The trouble is that this time, the people who would be put most at risk by these policies are pushing back and holding adult politicians accountable. There is something to be said for a teenager looking a powerful adult directly in the eye and not backing down from their convictions. It is inspiring, even if the cynic in me wonders whether it is ultimately pointless. I am trying to put my cynicism away though. A thing that happens in situations like this is that adults applaud young people for their bravery and brilliance, but then don&apos;t listen when those young people explain what they need in order to lead. I want young people to lead this movement, but I also think that in order for it to sustain itself, it can&apos;t be a parade where everyone applauds, but no one follows. The social media generation is also the generation that has been left with a unique relationship to gun violence: It&apos;s a footprint that they run the risk of stepping in every day. They are using the tools they know best to find their way into a conversation that they normally wouldn&apos;t be invited to, and maybe that&apos;s what everyone is so afraid of: the world moving forward without them, led by people who are smarter than they were ever thought to be.